The cultural influence of the Portuguese, combined with traditional Chinese life, has produced a unique landscape in Macau. Here Baroque churches and colonial mansions rise from cobbled pavements interspersed with plazas and cafes. 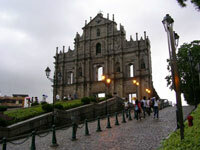 Visitors are enticed here by the lure of gambling, but many of Macau's attractions result from its architectural heritage. St Paul's Cathedral is one such legacy that dates back to the early 17th century. It is an Italian-designed building perched on a hilltop that is most spectacular when illuminated against a night sky. The vantage point from the Fortaleza de Monte is a good place to reflect on the defensive role it played against Dutch assault in 1622, and it is worth exploring the museum and meteorological observatory. The classic Chinese temple of A-Ma rests at the base of Penha Hill. Its name derives from Tin Hau, Queen of Heaven, or the Honoured Mother. Myth has it that a poor girl saved the fishing vessel, on which she was travelling, from the ravages of a storm. In tribute to her this temple was built and has been established as a place of pilgrimage for Macau's fishing community. Another temple dedicated to the power of female intervention is the Kun Iam Temple, built in honour of the Goddess of Mercy, located in the northern reaches of the peninsula. It was here, in 1844, that the first trade and friendship treaty between the USA and China was signed. Macau is 37 miles (60km) west of Hong Kong; ferries take around an hour to get there and leave roughly every fifteen minutes.